Bree Milford had big city dreams. But when her glamorous career fails to materialize, she can't pay her big city rent. Slinking home to the sleepy town of Danger Cove to reorganize and figure out her life, she agrees to run the family's Ocean View Bed & Breakfast while her parents go on vacation. After living in fast-paced L.A., Bree fears she'll be bored with small town life. However, it becomes anything but dull when she convinces her parents' hot handyman to expand the tiny closet in the living quarters...and a dead body falls out of the wall! Things get even more interesting when the medical examiner puts the time of death right around when her parents took possession of the B&B and started renovations. Worried the police have Mom and Dad in their sights, Bree asks her best friend, Cristal, to stick around for backup. With her high maintenance BFF by her side, and the handsome handyman on her suspect list, Bree has her work cut out for her. She's on the clock to prove her parents' innocence before they end up behind bars...and the killer can strike again! 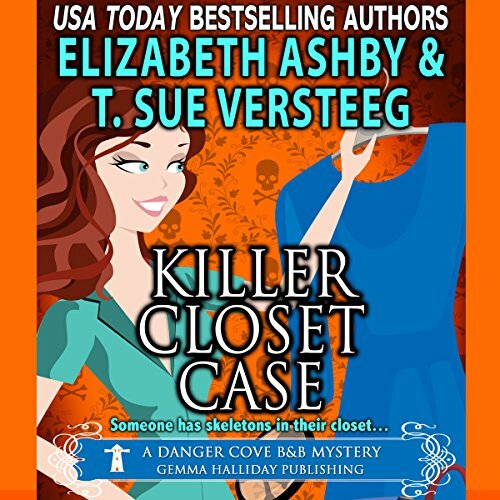 Bree Milford has tried unsuccessfully to get a career in Hollywood, so she goes to mind her parents’ Ocean View Bed &amp; Breakfast in Danger Cove, Washington in Killer Closet Case by Elizabeth Ashby and T. Sue Versteeg. Taking off for a Bon Jovi concert in San Diego, Bree’s parents leave Bree in charge, along with her supermodel best friend, Cristal, who has had to escape Hollywood due to a big tabloid scandal. Noticing how tiny the closet in their bedroom is, the women ask the gorgeous Scottish handyman, Mal, to examine if there is room for him to enlarge it. But when he opens up the back wall of the closet, a mummified body wrapped in plastic falls out and onto Bree! The police of course want to talk to Bree’s parents, who have spent their many years of marriage moving throughout the country every few years and who bought and renovated the B&amp;B two years earlier. But true to their free nature, they do not have their cell phones on, making them look suspicious. Bree’s brother, Bradley, in his last year of law school, comes to help them, especially as the police find a second body wrapped in similar plastic, and their dad becomes the chief suspect. This book is the sixth book in the Danger Cove B&amp;B Mystery series, but it was my first book in the series, yet I did not feel any confusion about starting it so far into the series. I enjoyed the story and found it pleasurable light reading. The growing chemistry between Bree and Mal comes across very believably, and I found myself rooting for them to find happiness together. The characters do not really have much depth to them; this book seems to be less concerned about making them full than in creating a gentle mystery to make readers smile while still relaxing. Pamela Lorence performs the audio version of this book and has a great voice for reading the first person narration of Bree. She does a great Scottish accent for the character of Mal and speaks expressively as she reads the whole book. Lorence has a gentle way of speaking that adds to the flavor of the book as a gentle cozy mystery. Killer Closet Case was an enjoyable read. It wasn’t anything terribly memorable but is nice for the days when my brain isn’t up to a more erudite book. I give this book four stars! Disclaimer: I was given this book for free by the author, but that in no way affected my review, and I even plan to go back and buy the first book in the series!